This tutorial will walk you through configuring Azure DevOps (previously known as Visual Studio Online) to enable source control on your models. It’ll also help you learn about other productivity features in the development tools, including the ability to create and organize TODO task, search metadata and source code, navigate between related model elements, and create a project from a model. 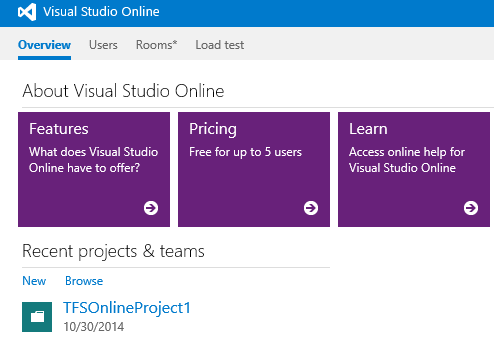 In this section, you'll create a new project in Azure DevOps. This project will host the source code of your model. You'll use the Fleet Management model as an example. If you don't have a Azure DevOps account, you'll create one. Navigate to http://www.visualstudio.com/ to sign up for Azure DevOps. Click Sign up. If you already have an account in Azure DevOps, go to the Create a Azure DevOps project section later in this topic. Sign in with your Microsoft account. Note: You can also use an organizational account (Microsoft Office 365 domain). Create a Azure DevOps account, and select a URL for your account. This is the URL that you'll connect to from your development computer when you're configuring source control in Visual Studio. The following is an example of the account URL. When the account is created, you're directed to your account main page where you're prompted to create your first project. Create a demo Fleet Management project. If you already have a Azure DevOps account, go to your account using Internet Explorer. This topic uses .visualstudio.com as the example URL for illustration purposes. Under Recent projects & teams, click New to create a new project. In the Project name field, enter Fleet Management, enter a Description, and then click Create project. If you have migrated your code from a previous version using the Lifecycle Services (LCS) automated code upgrade tool, the following folder structure is automatically created in your Azure DevOps team project. The Metadata folder contains your source XML files organized by packages and models and the Projects folder contains Visual Studio projects. If you are not migrating code and are starting from scratch, create a similar folder structure on the server in your team project before you start development. Start Visual Studio 2013 as Administrator. Click Project > Options > Source Control > Plug-in Selection. 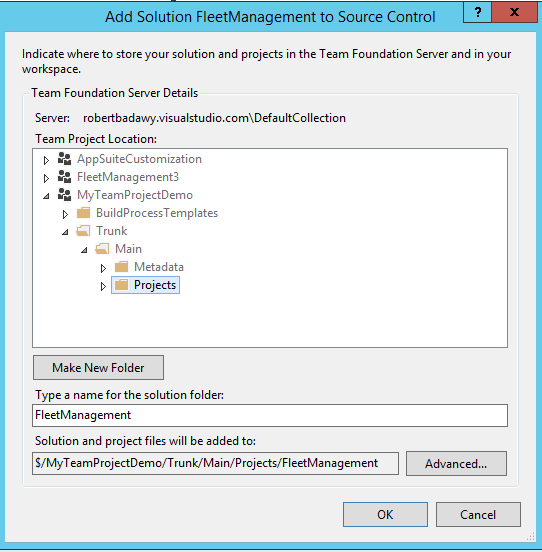 In the Current source control plug-in field, select Visual studio Team Foundation Server. Select Team > Connect to Team Foundation Server. In Team Explorer, click Select Team Projects. In the Select a Team Foundation Server drop-down list, select the Azure DevOps account that hosts the Fleet Management project, or click Servers if it isn't in the menu. 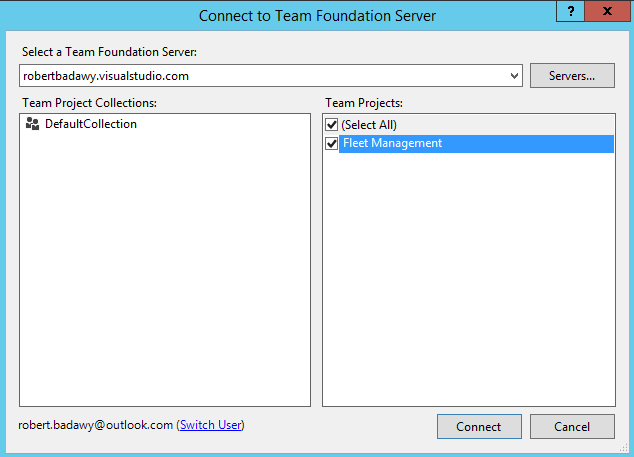 When the Add/Remove Team Foundation Server dialog opens, click Add. Enter the URL of your Azure DevOps account. If prompted, enter your Microsoft Account username and password. Select the Fleet Management check box under Team projects, and then click Connect. Your model store root folder contains source files of all packages and models that are part of your application. During deployment, you'll probably use source files from more than one model across more than one package. Because of this, we recommend that you map your model store root folder to the Azure DevOps team project metadata folder. 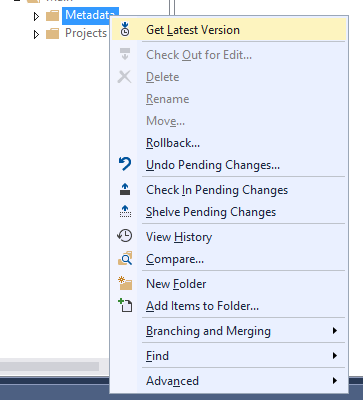 In Visual studio Team Explorer, connect to the team project as described earlier in this document. Open Source Control Explorer from Team Explorer. Map the Metadata folder of your team project to the root folder of the model store on your local drive (Typically c:\packages), an example is shown in the image below. Note: Your model store may be located under I:\AosService\PackagesLocalDirectory or another drive, depending on your machine configuration. Click Map, and on the next dialog, click No. Similarly, map the /Trunk/Main/Projects **server folder to the **local projects folder that will hold your Visual Studio solution and project files. This section describes the steps needed to add a solution to Azure DevOps source control. This scenario is relevant when you have started development on a new model and you are adding it to source control for the first time. For code migration scenarios or in the case you are synchronizing new models that have been created by another developer, refer to scenario 2 below. Note: This is only an example. You can open any project/solution to learn about the process of adding a solution to source control. On the File menu, point to Open, and then click Project/Solution. Browse to the desktop and open the FleetManagement folder. 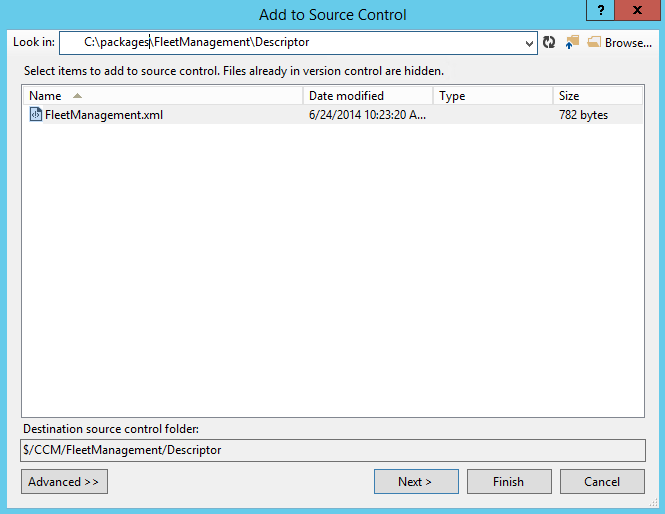 Select the solution file named FleetManagement. The file type listed is Microsoft Visual Studio Solution. If the solution file is not on your computer, the steps to create it are listed in Tutorial: Create a Fleet Management solution file out of the Fleet Management models in the AOT. Click Open. Loading the solution may take some time. In Solution Explorer, right-click the Fleet Management solution, and select Add Solution to Source Control. On the next dialog, select Team Foundation Version Control, and then click Next. Go to Team Explorer > Pending changes, and then click Check-in to check-in your solution and its model element to the Azure DevOps source control. All Visual Studio projects belong to models. Models are source code distribution and deployment units that are typically larger in scope than a Visual Studio project. In the previous section, you added element files of the fleet management solution to source control. Because this was the first time that you added elements of the Fleet Management models to source control, you'll also need to check-in the model descriptor file. 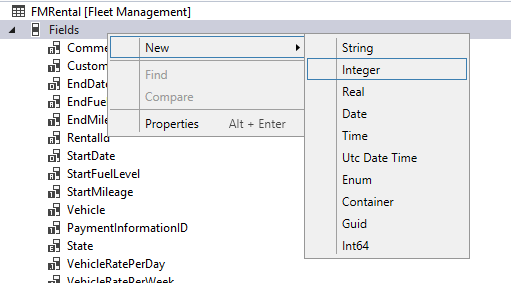 In Visual Studio, in Team Explorer, open Source Control Explorer, and then right-click on the metadata folder (for example, \Trunk\Main\Metadata). In the Source Control Explorer toolbar, click Add Item to Folder. Select your model descriptor file. The model descriptor file is the XML file manifest of your model. It's located in the Descriptor folder of the package that the model belongs to. The following image shows an example of where the model descriptor file of the Fleet Management model exists (c:\packages\FleetManagement\Descriptor\FleetManagement.xml). Note: Your model store may be located under I:\AosService\PackagesLocalDirectory or c:\AosService\PackagesLocalDirectory or another drive, depending on your machine configuration. Check-in your pending items. Your item is now ready for development of the fleet management application using a state-of-the-art, cloud-based source control system and many other application lifecycle features of Azure DevOps. In this section, you'll make minor changes to the FMRental table and compare your changes with the latest version in your source code repository. 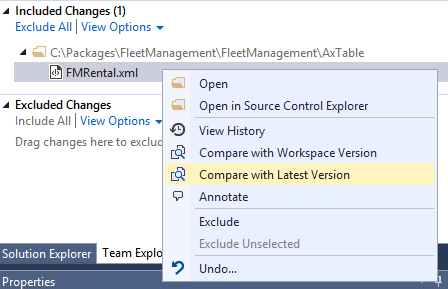 In Solution Explorer, click Fleet Management Migrated > Data model > Tables > FMRental. Double-click FMRental to open the designer. Right-click the Fields node, and then click New > Integer. Right-click Methods, and add a new method. In the X++ code editor, enter a comment in the new method. Enter a comment in any existing method. In Team Explorer, right-click FMRental.xml, and select Compare with Latest Version. Browse through the differences in the comparison (Diff) window. 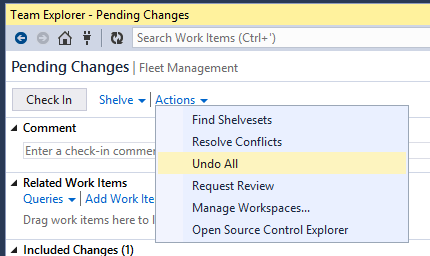 In Solution Explorer, right-click on the FMRental table, and select Source control > Undo > Pending Changes to revert your changes. Confirm the undo on the next dialog and close the diff window. In this section, you will synchronize existing models and model elements from your Azure DevOps project. This is relevant in the following cases: 1) You have migrated your code from a previous version via LCS, or 2) another developer has checked-in a new model or new model elements and you would like to synchronize them to your development environment. In Source Control Explorer, right-click on Metadata and select Get Latest Version. This will synchronize you local packages folder with the latest code. Alternatively you can use the Advanced menu to synchronize specific build version or change sets. 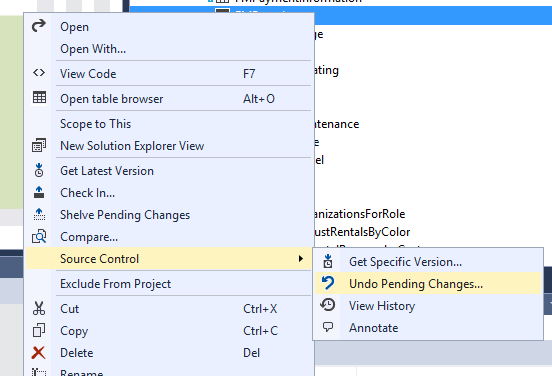 Once synchronization is complete, and if this leads to synchronizing new models to your environment, you need to refresh your metadata from Visual Studio. This section describes how you can create a Visual Studio project out of tasks (TODO comments) embedded in your X++ code. 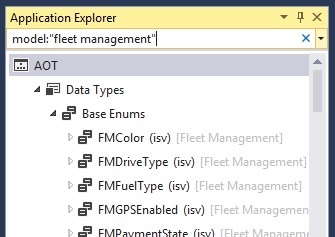 In Solution Explorer, click Fleet Management Migrated > Code > Classes > FMDataHelper, and then double-click FMDataHelper. This will open the X++ code editor. Enter a TODO comment (//TODO: my comment) inside any method. Open other Fleet Management classes or tables and add more TODO comments. Rebuild the FleetManagement Migrated project. 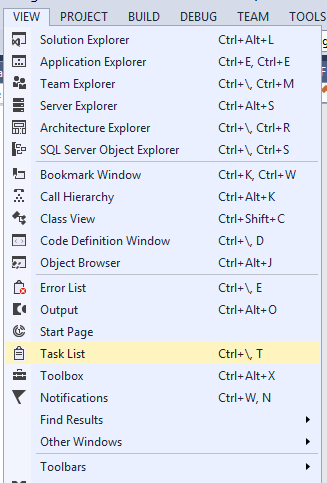 Click View > Task List, to open the Visual Studio Task List window. Select Comments from the drop-down list. Select all TODO items, right-click, and select Add to new project. This will open the New project dialog and enable you to create a new project that contains all of your TODOs. You can save this project as a working project to manage your TODO list. When you're finished, undo all of your pending changes in Team Explorer. Click File > Close Solution, to close the FleetManagement solution. This section demonstrates how you can perform meta-data based searches throughout your application. Click Dynamics 365 > Metadata search. 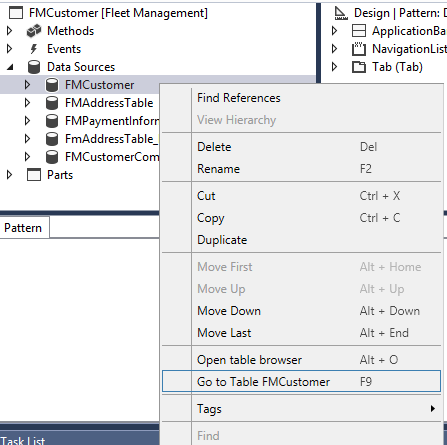 In the Metadata search window, in the Search field, enter the following text to find all of the table insert methods in the Application Suite model that contain a cross-company query. type:table,method name:insert code:"crosscompany" model:"Application Suite"
Wait for the search to complete. It may take a while. Double-click a result in the list. The code editor will open and place the cursor at the line that matches your search criteria. Select several elements in the results list by holding down the Ctrl key for multiple selections, right-click, and then select Add to new project. This will let you to create a new solution and project containing the selected elements. Find vertical tab controls defined in view mode and auto-width mode in the model Application Suite. 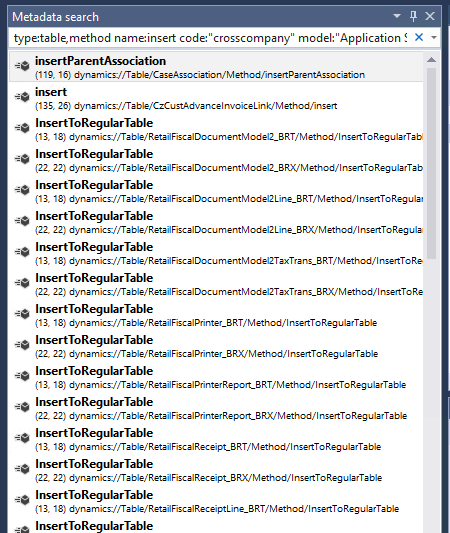 type:form,formtabcontrol property:arrangeMethod=Vertical,ViewEditMode=view,WidthMode=Auto model:"Application Suite"
Find all SimpleListDetail forms in the Application Suite model. type:formdesign property:style=simplelistdetail model:"Applicaiton Suite"
Use the search bar drop-down menu to access previous searches. This section highlights a feature that enables you to move from one element to a related element without having to find the related elements in Application Explorer or Solution Explorer. Open Application Explorer, and switch the view to Model View. 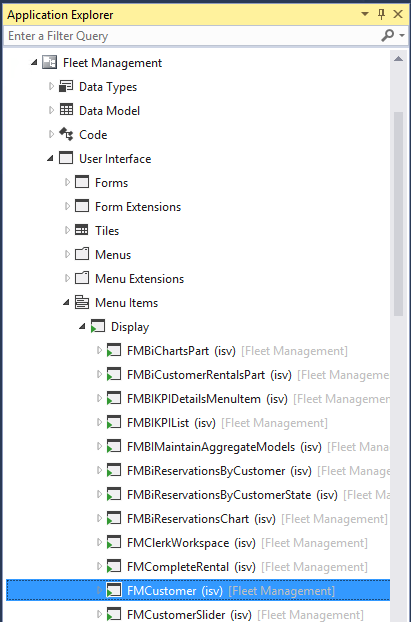 Under the Fleet Management model, click User Interface > Menu items > Display Menu Items > FMCustomer. Right-click FMCustomer, and then select Open designer. 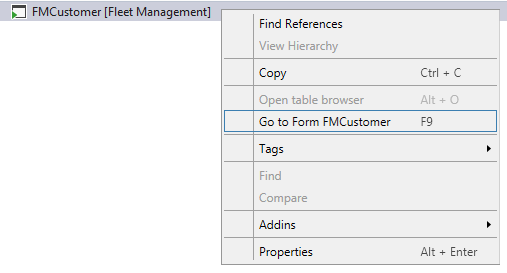 In the FMCustomer menu item designer, right-click the root node, and then select Go to Form FMCustomer. The FMCustomer form designer will open. The FMCustomer table designer will open. Using the same methodology, you can navigate to the EDT element that a table field references. Tip: Press F9 instead of opening the context menu. F9 will open the designer of the referenced element. Tip: You can add an element to the current project by right-clicking on the document tab and selecting Add to project. You can use Application Explorer to search for all or some elements of a model and create a project out of the search results. Make sure the option to organize a project by element type is on. Go to Dynamics 365 > Options > Projects. 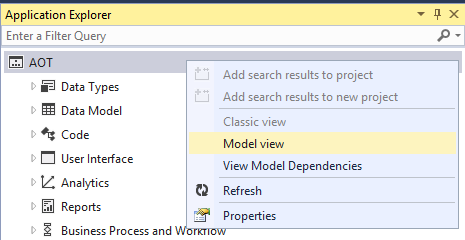 Go to Application Explorer and search for elements in the desired model. For example, enter* model:"fleet management"* and click Enter. When the search is complete, right-click the AOT root node and select *Add search results to new project. 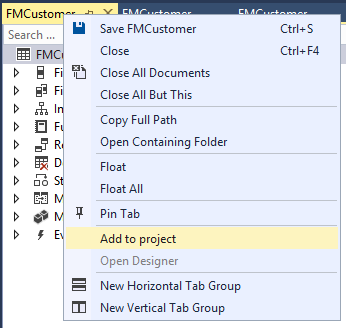 Specify your project properties in the new project dialog and click OK to create the project. Tip: To create a project from search results, you can add any type, name, or other filters to your search as long as all results are in the same model. For example: model:"Fleet Management" type:Table name:^FM will return all tables in the Fleet Management model with a name starting with the letters FM.